Allspice/Kabab Chini is a powerful spice that is derived from the dried fruit of the pimento tree. This spice is popular for its special aroma which is a combination of cloves, cinnamon, nutmeg and ginger. Popularly known as pimento or Jamaican pepper, allspice is amongst the most widely used spices in the Central American cuisines. The unique flavor and healthy quality of this herb makes it popular all over the globe. 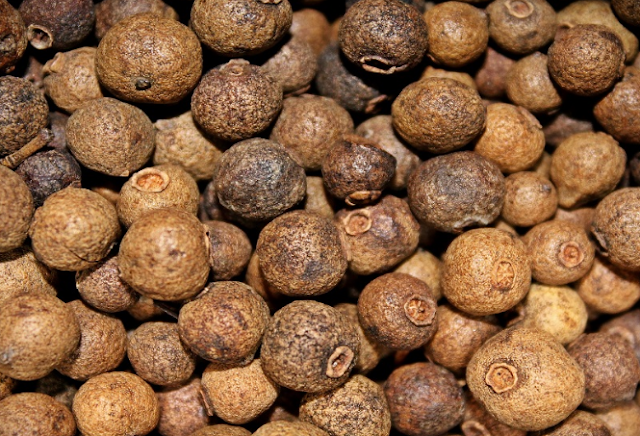 Allspice is known to have anti-microbial, medicinal, insecticidal, anti-oxidant and deodorant properties. This spice is loaded with nutrients like Rich in potassium, manganese, iron, copper, selenium and magnesium. It is a common spice used in many western cuisines. In English it is called as Allspice, In Tamil it is called as Sarvasukanthi, In Malayalam it is called as Sarvasugandhi, In Telugu it is called as sarva, In Kannada it is called as Gandamenasu, In Hindi it is called as Shimla Mirchi, In Bengali it is called as Kebab Chini and In Marathi it is called as Gol Mirchi. Allspice is one such herb that contains a rich amount of manganese that provides healthy bones and strengthen them naturally. It also protects the body from health conditions like Osteoporosis and arthritis, which occurs due to manganese deficiency. Rich in Iron content, Allspice is one of the best remedy that improves your energy levels and boost the supply of oxygen in the body. It is also highly effective in enhancing your physical performance as well as cognitive abilities. This herb is also great to consume for Iron deficient people. Due to the calming and soothing effects of allspice, this herb is very useful in improving digestion naturally. Regular intake of allspice also helps in treating several stomach related problems like constipation, diarrhea, vomiting as well as nausea as it contains eugenol. Apart from anti-bacterial, antimicrobial and antiseptic properties, allspice is also a wonderful herb that improves the dental health and protect your gums and teeth from bacterial pathogens. As allspice possess antibacterial and antifungal properties that kills stomach bacteria, this herb is surely one of the best herb to improve the functioning of the immune system. It also enhances the functioning of the gastrointestinal system which help you improve your overall health. Adding allspice to certain foods, works to kill the bacteria in the food, even before it enters your body to damage it. If you are looking for one sure shot way to reduce constipation, then allspice is all you need to treat the problem effectively. Being a rich source of fiber, allspice also helps in soothing infrequent bowel movements and provide relief from constipation. Due to low glycemic index, allspice works wonder in lowering blood sugar level and is best for people suffering from Type II diabetes. You can also intake, this herb in the form of tea before the meals. Rich in antioxidant properties, allspice is a great remedy to neutralize the free radicals and to improve heart health. The presence of potassium in allspice helps to prevent the risk of getting atherosclerosis, strokes and heart attacks as it is a vasodilator and works amazingly to release the tension on the cardiovascular system. Allspice contains many essential nutrients and minerals like copper and iron, that increase the production of blood red cells and improves the blood circulation in the body. As it contains anti-inflammatory properties, Allspice is highly effective in lowering inflammation and provide instant relief from pain. It also helps in treating gout, muscle aches, arthritis as well as hemorrhoids. Allspice is loaded with various minerals like potassium, manganese, iron, selenium and magnesium. These minerals and other vitamins present in allspice make it a perfect antioxidant. Allspice contains eugenol, quercetin, tannins, and other chemical compounds which are a very potent antioxidant. The antioxidant properties of allspice work to fight against the free radicals in the body and neutralize them and promotes good health.